About Just an abstract from leaves at the Botanical Gardens. I imagine you have a great analytical brain. Because you observe very well the so small details. And with your aesthetic comprehension your shots become PERFECT. Another surprising perfect shot married with geometric forms and soft colors. Re: my name, my last name is Spanish by way of South America (Equador). Or did you mean Maryanne? I always say that my parents named me Maryanne to name me after as many relatives as possible -- lots of Mary's, Anne's, Anna's and Anita's. Very nice abstract -- really works well compositionally and the lighting and color are perfect. Thank you very much Baha. So glad you like it dear John! Fantastic colors and lighting, a flora subject that easily can be a great abstract! Amazing wave like shape of the lines at the top, a beautiful microscopic world and a frame that really try to gives us the idea that we...are inside on that plant! Thank you so much dear Marco!!!! Thank you for your comment and visit Sethu. Great abstract!. You have a wonderful eye to visualize such abstracts before its taken!.. Usage of curves was well thought!.. well done! Thank you so much dear Malules. I have missed you. Great abstract. Excellent light and colors. very interesting shot! great colors. well-composed & colors. keep in contact Julie dear. Glad to see you back on my portfolio dear Dan. Thank you so much for your comment sweetie. Thank you so much dear Marian. I am honored to have this image in your favorites. Thank you my friend. Wonderful colors Julia, these are so vibrant. Hope you are doing well. Very nice abstract dear Julie with lovely colours on the leaves. I love the flow of the lines and patterns, the changes of colours overlapping have all made for a wonderful shot. a fine abstract shot dear Julie!! So happy to see you around again. Thank you so much for your comment and I am honored to have this be part of your favorite. Thank you!!!! Glad to see you around again. Hope all is well my friend. Thank you so much for taking the time to comment. Excellent work Julie! I love the curves of the leaves and pinks. All the details in the lines make it perfect! Amazing abstract my dearest Julie.. The way you shot this wonderful arrangement shows a mastery at controlling light, colors, and reflection. Showing just enough to wet the appetite of the viewer. I love your work, a piece of art! Love the curves, and the colors, makes a great abstract!! Very creative and very well done dear Julie...big hug!! A great abstract with excellent light and very attractive colours and patterns. Thank you so much my dear friend Tommaso. I am glad you like it. Thank you so much dear Ananda. Excellent and superb vision dear Julie. 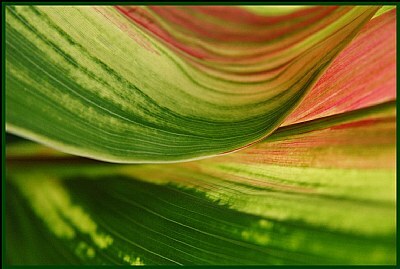 I love shades of green and red colors. An abstract very attractive. Compliments! This is a fascinating abstract. Brilliant work Julie. Hello my dear Julie - what a wonderful abstract of these leaves - they are beautiful - lovely colors and tones- great light as well - It appears like a big swirl of colors and I like it very much - great job !!! Thank you so much dear Mel. Hi my dear Nicki, I thought of a wave as well when I shot it :) see great minds think alike! Thank you so much for your kind comment my friend. Having your support and friendship mean a lot to me. Thank you so much my dear Riny. Thank you so much Jacques. I appreciate your comment. So glad you like it my friend. Thank you! Thank you so much dear Luca. Glad you like it. Thank you very much Gerhard. I appreciate your comment. hahahahhahahaha, you called me Julietta...hahahaha, made me think of an Italian friend of mine that used to call me that. Thank you so much cara amica. Thank you so much dear Aziz. Glad you do Yazeed. Thank you! Thank you for taking the time to comment Habib. Thank you so much Nilanjan. Oi linda muito obrigada. Fico feliz que voce gostou. Thank you very much GG. Thank you very much dear Mitra! Muchas gracias Alicia. Me alegra que tu gusta. nice nature abstract with nice colour. I wish you a happy day and don't work too much!!! incredible capture, very nice details and colors, a real nice abstract Julie. and fantastic soft focus in this colors explosion!!! the range of colours and texture are amazing! I love it , for its curves and colors. I like this, it has all the elements of a good photo. And it just makes me feel dizzy bcse of the lines. Well seen. nice abstract... really liked it.. including the colors..
Julie querida,que maravilhoso abstrato!!!!! :)As cores estão fantásticas! Great use of colors and the light. Well cropped and seen. Lovely colors and shot, dear Julie. Un abstracto magnífico, con las texturas de las hojas, da frescura y es un regalo para los ojos! Thanks Deb. I really appreciate your support my friend. beautiful!!!! your learning curve has become steap now!! !